100 years ago this week, Governor Edward F. Dunne signed a bill giving women in Illinois the right to vote for President. 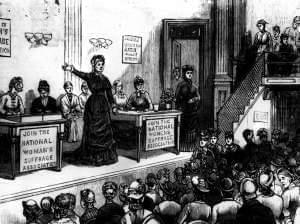 This hour on Focus, we remember Illinois’ push for women’s suffrage. Burma is one of the poorest countries in Asia. A long period of military rule has kept the country from developing either politically or economically. But that may be starting to change. One sign of that change was the recent election to Parliament of the country’s leading opposition figure Aung San Suu Kyi. Next time on Focus our morning talk show we will review recent events in Burma as we talk with Christina Fink, from the Elliot School of International Affairs at the George Washington University in Washington, D.C.